Ordinarily we expect to pay a significant sum for any real leather accessory that meets our everyday needs. However Brynn Capella shows us we can keep our costs down without skimping with her Lauren bag. While the Lauren doesn't make a particularly strong style statement, it's quite a lovely looking bag. I feel a slight sense of déjà vu as I look at it, but I can help admiring the way its supple leather slouches gently around the top. That red color is also really striking, although I think I like the Lauren just as much in navy and white. Traditionalists may be disappointed there's no black or brown option, but I'm glad to see a label being less predictable. The Lauren looks modern and youthful, but its appeal goes beyond its surface. We can wear this bag in a variety of ways. The short strap makes it a shoulder bag, while the longer strap converts it into a cross-body. Both are removable so we can enjoy a clean look no matter what mode it's in. Similar purses can easily fetch more than $1000, so I was pleasantly surprised to see the Lauren costs just $298. That's a steal for any bag that offers such luxury and street smarts. 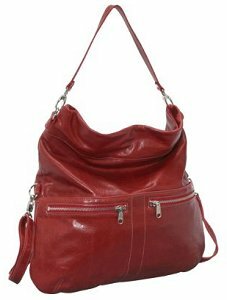 The Brynn Capella Zee satchel bag, a great alternative to this large leather bag.